Working out will get the weight off. Won't it? ﻿Fitness clubs often associate their advertising imagery with losing weight, as well as promoting a better physique. But the simple truth is that losing weight is first and foremost a dietary issue with exercise coming a distant second. You will need to eat differently and probably reduce the amount you eat if you want to lose weight. Doing 'sit-ups' and ‘crunches’ won’t help you lose fat from those targeted areas either. But exercise is in many ways the best possible medicine with formal ‘workouts’ not necessarily being needed. Research shows that exercise can be as good as or better than taking pills for treating depression. Strength training actually increases your bone and muscle strength making daily activities easier. One recent study tracked five professional cyclists participating in the Tour de France. With an average bodyweight of just 69kg, they took in on average, 850 grams of carbohydrates and 5,800 calories daily. But as hard-core athletes, their weights barely changed during the tough 3-week event. For us normal mortals, simply walking more would make us that little bit healthier. Even gentle exercise increases the flow of blood to the brain releasing BDNF - essential for maintaining healthy neurons, creating new ones and potentially staving off neurological diseases, including Alzheimer’s and Parkinson’s. Just look at this comparative brain scan from Dr Chuck Hillman which he carried out with students at the University of Illinois. There's a lot more going on up there after that 20 minute walk! Gentle exercise gets the blood pumping and arguably does as much to stave off Alzheimer's as does finishing the Times crossword every day. So, just start ‘moving’ if you want to be healthier. Exercise has many benefits but I'm sorry to say that exercise alone, without changing your diet contributes little to weight loss. 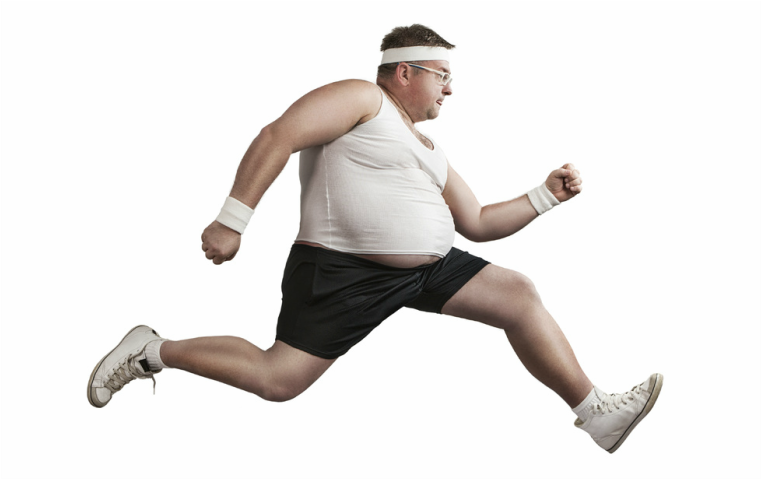 You really can't outrun a bad diet! As they explain in the film, Fed Up; you'd have to swim for 1 hour and 15 minutes to burn off the 400 calories in one medium size pack of McDonalds fries. True; you'd feel better after the swim (albeit exhausted) and there are also many other health benefits associated with exercise, but let's face it; it's a very inefficient and time consuming way to lose weight. "These classes will really get your blood pumping & your brain working"! We couldn't agree more. Yet would we agree on what 'eating well' really means? 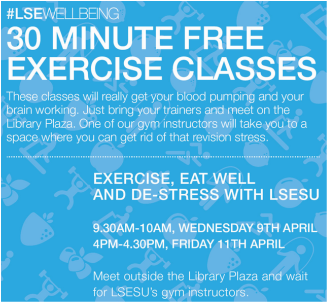 Try buying regular, healthy full-fat milk at the LSE cafe... you won't find it! You get to the gym, change, work out, rest, shower and find that you’re still sweating? Isn’t there something less demanding you can do that contributes to your general fitness and well-being? Well it turns out there is. Even small amounts of resistance exercise can increase your body’s levels of a substance called GLUT4 (acronym for glucose transporter 4), which encourages your digestive output to be stored in muscle cells rather than as body fat. A few simple changes to your life can make all the difference; without the need to work out, sweat and shower. Remember though; this is about general health and feeling good - it is not a specific way to lose weight. Your healthy diet-regime comes first. Standing apparently burns 1.36 more calories a minute than sitting, and puts you at less risk of a host of cardiovascular diseases. 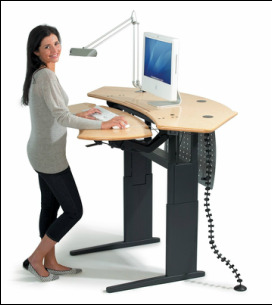 In fact the trend towards standing desks is increasing (albeit slowly). And when you stand, you can stretch your body and relax your cramped internal organs (after hours of sitting). ... Or maybe hold a standing meeting. My ex-boss ran meetings that way, not for health reasons, but because they were inevitably much shorter - which can't be bad. 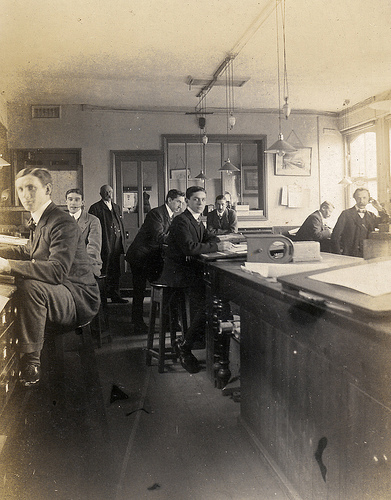 Dickensian times saw the first office workers but the desks were not necessarily for sitting at. 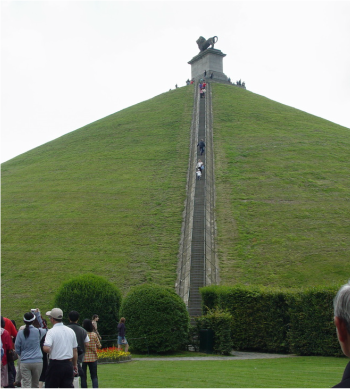 Just one minute marching up a flight of stairs will help; or what about striding briskly up the escalator; you can even try walking up and down a couple of flights twice and feel better for it. ​Garden work, cleaning around the house… yes even vacuuming can be a work-out! Just pick up the pace and burn up those calories while performing your favourite stretching exercises! 4/ Simply walk a bit further... or run? Walking burns up the calories too! According to a 2012 study, those who walked for one mile burned up 88 calories but those who ran the same distance burned 112 calories - not much more considering. But that being said, the calorie counting route is not the best solution. Your whole body benefits from exercise. So think of changing routines and doing things like parking your car deliberately at the far edge of the supermarket car park, or get off the bus one stop earlier and walk... if weather permits. 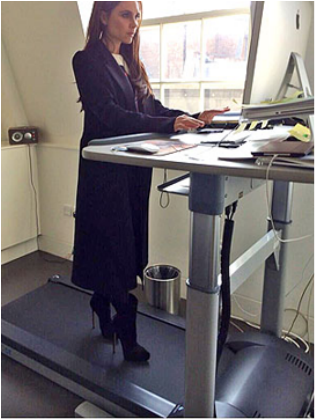 Here on the right; Viktoria Beckham goes one step further with her treadmill desk… and you can just make out the 'practical' high heels! Feeling more ambitious? Squatting and standing, squatting and standing... 20 or more repetitions help you in your hip and ankle mobility. It also provides your body with helpful and positive exercise related hormones. Full on push-ups too much effort? Start with a series of gentle wall push ups to strengthen your arm and chest muscle.